You’d think that after having decades to practiced, we’d have perfected the process toasting bread by now, but alas, blackened bagels continue to plague the world to this day. The toasters themselves aren’t the problem — it’s us humans who are inexpert at turning their knobs and dials to achieve the perfect slice. But not to worry; Dualit has developed a solution to the problem. Rather than forcing you to fiddle with a set of imprecise controls, the company’s latest set of toasters rely on a set of sensors and special toasting algorithms to mitigate human error and make you a perfect slice every time. With the help of this tech, the toasters not only take into account their own internal temperature, but also the temperature and conditions of the room they’re in, how many slices they’ve toasted, and how long they’ve had to cool down between uses. In theory, this should allow the toasters to make you consistently perfect toast no matter how heavily they’re being used. Now, if you’re concerned that your idea of a perfect slice of toast isn’t the same as Dualit’s, don’t be. In addition to all the extra smarts, these toasters still feature a dial or you to make adjustments, so if you prefer your morning slice a little on the lighter side (or darker, whatever) you can still make it happen. 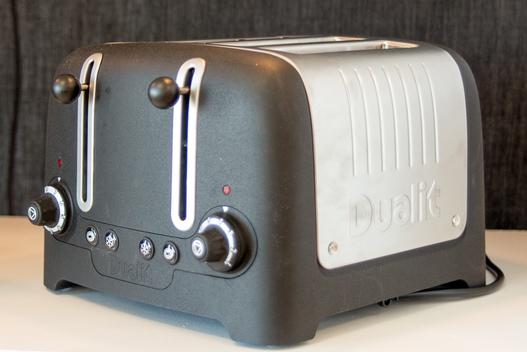 The technology can be found in two of the company’s new toasters; the new Dualit Stoneware Lite Four-Slice Toaster ($145) and the company’s Brushed Architect Four-Slice Toaster ($172). That’s definitely quite a bit more than most people are likely willing to pay for a bread browner, but if you’re serious bout your toast, or perhaps own a toast-focused restaurant of some sort, it might be a worthy investment.